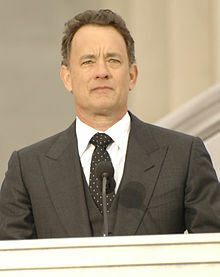 Thomas Jeffrey "Tom" Hanks (born July 9, 1956) is an American film actor, director, voice-over artist, writer and film producer. He is of English, German and Portuguese descent. Thank you. I'm standing here in lieu of my fellow nominees who are just as deserving, if not more so of this moment. I'm standing here because of an army of people who over the course of a back-breaking schedule that was set by Bob Zemeckis worked much harder than I did and who had much more at risk if our efforts were not successful. I'm empowered to stand here thanks to the ensemble of actors, men and women, who I shared the screen with and who in ways they will never understand made me a better actor. Man, I feel as though I'm standing on magic legs in a special effects process shot that is too unbelievable to imagine and far too costly to make a reality. But here is my mark, and there is where I'm supposed to look, and believe me, the power and the pleasure and the emotion of this moment is as constant as the speed of light. It will never be diminished, nor will my appreciation. And the meaning between two simple words that I can only offer you here: Thank you, God bless you in this room and God bless you all around the world. We live in a society where there is no law in making money in the promulgation of ignorance or, in some cases, stupidity. There are a lot of things you can say never happened. You can go as relatively quasi-harmless as saying no one went to the moon. But you also can say that the Holocaust never happened. At the November 2002 Cape Canaveral premiere of the IMAX version of Apollo 13. Associated Press: Hoaxers vs. Rocket Scientists: Even NASA unsure how to counter claims of faked moon landings, December 21, 2002.